Lieutenant Colonel Quintin Jones is a native of Memphis, Tennessee. He completed his undergraduate education in 1998 at the United States Naval Academy, earning a Bachelor of Science in Political Science and his MBA from Strayer University in 2010. He was commissioned a Second Lieutenant in the Marine Corps through USNA in May 1998. 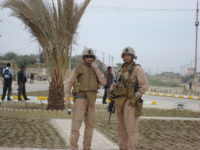 Following The Basic School and the Infantry Officer Course, he was assigned to 1st Battalion, 8th Marines, 2d Marine Division at Camp Lejeune, NC in October 1999. 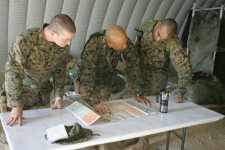 During this tour, Lieutenant Jones served as a rifle platoon commander and executive officer deploying as a part of the 22nd MEU, participating in Operation Dynamic Response/ Adventure Express in Kosovo. Additionally, he served as the Headquarters and Service Company Commander. 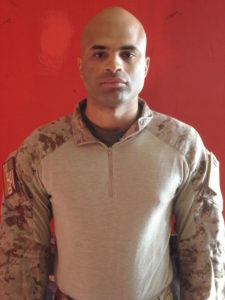 In October 2002, Captain Jones transferred to Marine Corps Security Force Battalion, Second Fleet Antiterrorism Security Team Company, Naval Weapons Station Yorktown, VA where he served as an assistant platoon commander and a platoon commander with deployments to 6th Fleet in Naples, Italy and 5th Fleet in Manama Bahrain. He also served one year as the force deployment officer for the Battalion in Norfolk, VA. In February 2005, he received orders to the Infantry Career Captain’s Course, Ft. Benning, GA. Upon completion of career level school in July 2005, Captain Jones reported to 3d Marine Division, Marine Corps Base Kaneohe Bay, Hawaii for duty as a Military Transition Team member in support of 3d Battalion, 3d Marines deployment to OIF 5-06. 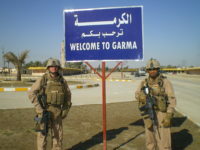 Upon return, Captain Jones assumed command of Company L, 3d Battalion, 3d Marines in October 2006 and subsequently deployed the company in support of OIF 06-08.2, in Al Karmah Iraq. In April 2008, Captain Jones transferred to Marine Barracks Washington, D.C. at 8th & I, and served as the Operations Officer and a parade commander for two parade seasons. In July 2010, Major Jones transferred to the Pentagon where he served as the Marine Aide to Camp to the 29th Chief of Naval Operations. In December 2011, Major Jones received orders to the Australian Command & Staff College-Joint, Canberra Australia, where he graduated and obtained a masters degree in Military Studies from the Australian National University. Upon graduation in December 2012, Lieutenant Colonel Jones reported back home to 3d Marine Division in Hawaii where he served as the executive officer of 3d Battalion, 3d Marines and the 3d Marines’ Operations Officer. While serving as the Regimental Operations Officer, Lieutenant Colonel Jones was selected to command 1st Battalion, 3d Marines. Lieutenant Colonel Jones’ personal awards include the Meritorious Service Medal w/1 gold star (in lieu of 2nd award), Navy-Marine Corps Commendation Medal w/ 3 gold stars (in lieu of 4th award), Army Commendation Medal, and the Combat Action Ribbon. Marine Humor. Ralph Peters. New York Post. September 1, 2007. 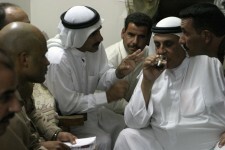 Karmah sheik confides in Marines. Pfc. Brian Jones. 2nd Marine Division. September 28, 2007. 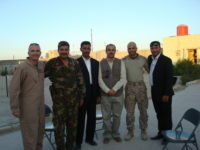 Marines in Karmah have joined the battle for the hearts and minds of Iraqi citizens. Geoff Ziezulewicz. Stars and Stripes. January 23, 2008. Now They Have Turned to the Tribes. Michael J. Totten. April 17, 2008. Captain Quintin Jones (C). Twentynine Palms, Calf. November 2005. Captain Quintin Jones (L). Al-Karmah, Iraq. September 2007.